Get the shirt. Wear it October 4. 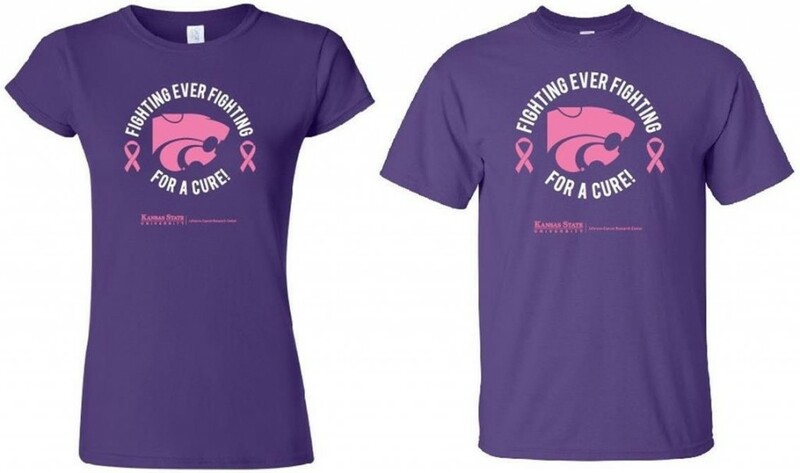 Wear the K-State Fighting for a Cure shirt to the game—or anywhere!—Oct. 4, in celebration of Breast Cancer Awareness Month and K-State cancer research! Join first lady of K-State Football Sharon Snyder, university president and first lady Kirk & Noel Schulz, and many other K-State fans as they show their pride in the university’s fight against cancer Oct. 4. Help spread the word! 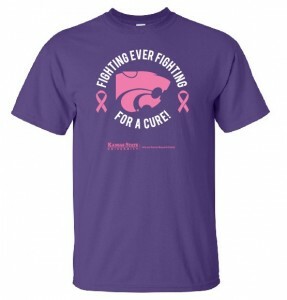 Post pics on Facebook and Twitter of yourself and friends wearing the shirt, and use #HelpKStateFightCancer hashtag. Get the shirt! They are $20 and offered in unisex, ladies’ junior and youth sizes. They’re available at our center or shipped from our webstore sponsored by N Zone. They are also available at Varney’s. We thank N Zone and Varney’s for their support! Visit our Fighting for a Cure Shirt webpage for more details. We’re having a Tailgate Party Oct. 4, too! We’d love for you to join us! The 17th annual Rob Regier Memorial Golf Tournament will be at 1 p.m., Oct. 3, at Manhattan Country Club. Rob was a K-State graduate in pre-dentistry who passed away from cancer at age 26. His family hosts the tournament in his memory. Players and sponsors are welcome! Tailgate without the work! Come to our Tailgate Party in Cat Town Oct. 4. Show your K-State pride by wearing the ‘Fighting for a Cure’ Shirt Sat., Oct. 4! 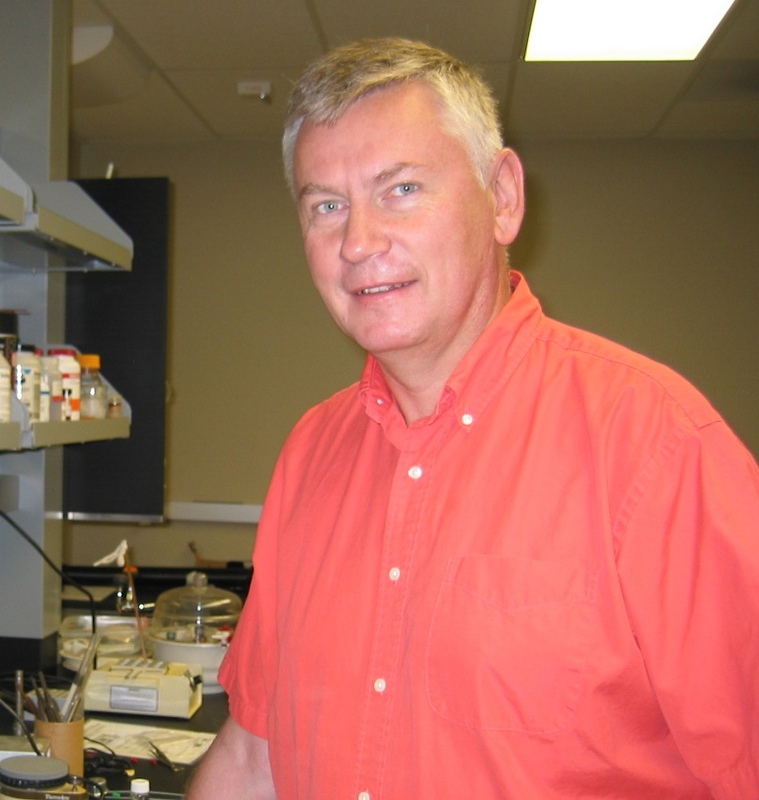 Jefferson Science Fellow Distinguished Lecture at 4 p.m. Fri., Oct. 10, 221 Ackert Hall. 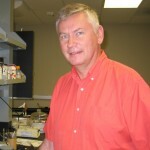 The speaker will be Mitchell Turker, Prof. of Molecular & Medical Genetics, Oregon Health & Science University. Our 5th annual Pink Power Luncheon for breast cancer awareness will be Oct. 17. The presenter, Susan Krigel, clinical psychologist with the Midwest Cancer Alliance and KU Cancer Center, will discuss “chemobrain.” Reservations required. 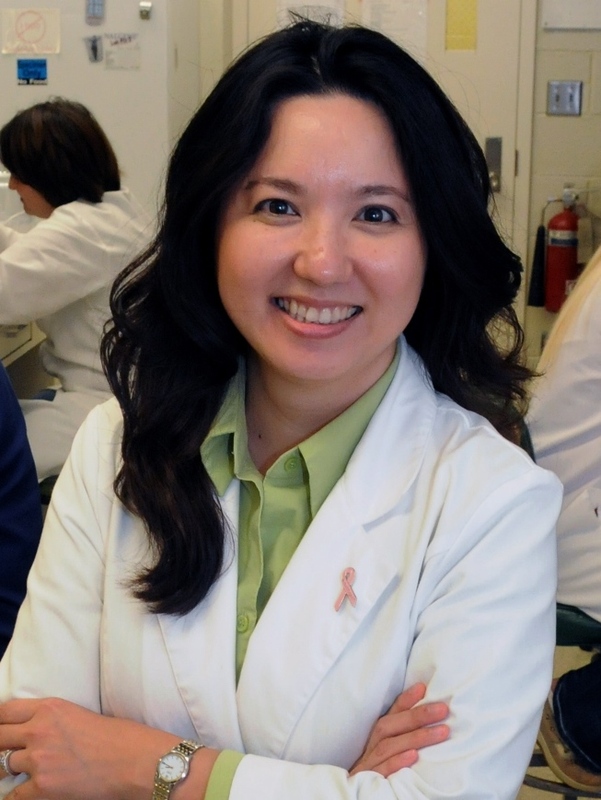 Dr. Annelise Nguyen, Diagnostic Medicine & Pathobiology, was appointed to serve a 4-year term on the National Institutes of Health’s Literature Selection Technical Review Committee for the National Library of Medicine. 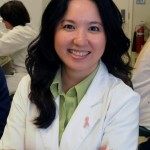 The appointment is based on quality of clinical and research accomplishments, publications in scientific journals, and other significant medical and scientific activities, achievements and honors. Anthony Middle School’s Silver 7 Team–that is, the 7th graders and their teachers–always sets aside a little of the money they raise for celebrations, to donate to a charity in Manhattan. For the past two years they’ve chosen our center. 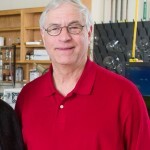 Some of them were introduced to us in 2010, when they were still at Marlatt Elementary School. They had witnessed their teacher, Lisa Morgan, fight and succumb to cancer, and participated in a school-wide t-shirt fundraiser that honored her in her final days and raised money for our center. Last year, when it was time for their middle school class to select a beneficiary, they voted to donate to our center in her memory. This year, they continued their support with another $250 gift. We are impressed by these students who keep giving in Lisa Morgan’s memory, and honored to receive their meaningful gifts. 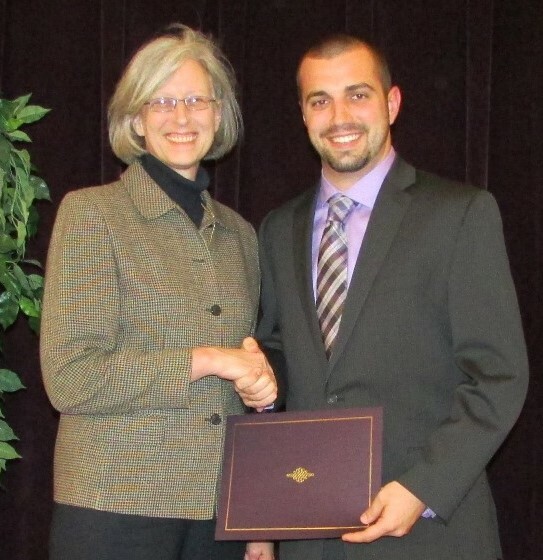 Maybe in a few years, one of the Silver 7 kids will receive one of our student research awards that they’ve helped fund! We are grateful again to K-State Head Football Coach Bill Snyder and Sunny 102.5 FM for sponsoring the Wildcat Challenge to Tackle Cancer. 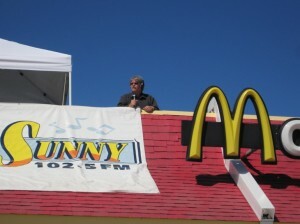 They recorded radio ads that are being played all over the state and sent letters asking people to join their challenge. 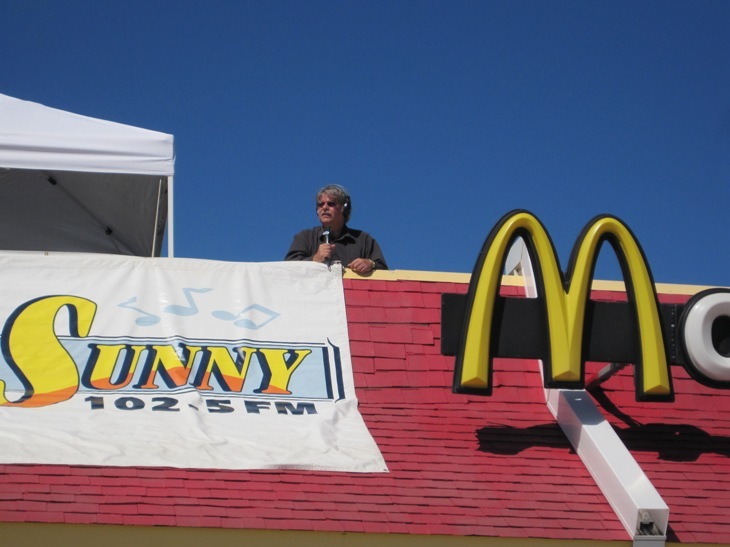 Sunny 102.5 is including us in several promotional activities and will have their annual, live fundraiser on Fri., Oct. 3, from the rooftop of McDonald’s on 4th Street, in Manhattan. 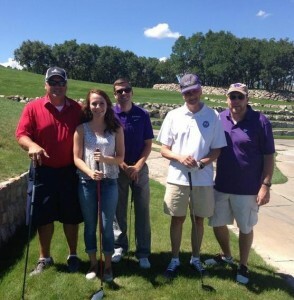 Hundreds of miles west of us in Castle Rock, Colo., a golf tournament on August 1 raised $20,240 for K-State cancer research! Western States Fire Protection held their annual golf tournament to support Mason’s Wish, a charity that raises funds for our center. Run by Mason Wolfe and her mom Nancy Wolfe, a 1990 K-State alumna, with support from family and friends, Mason’s Wish has raised more than $100,000 for us by selling candles, games, t-shirts and other items, and holding benefit events. 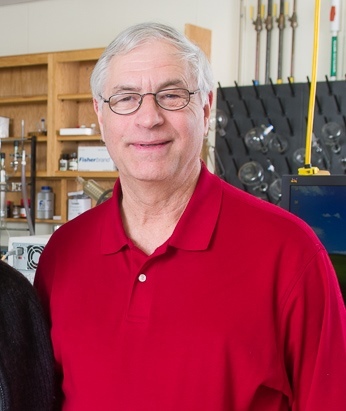 They started the charity after Mason’s father, Fred Wolfe, a 1993 K-State alum, was diagnosed with cancer in 2007. She wanted to do something to not feel hopeless and to help her dad and other families. Nancy recently joined our Advisory Council and her other daughter Morgan became a K-State student this fall. Mason dreams of becoming a brain surgeon and is considering attending K-State in a couple of years. The 8th annual Tough Enough to Wear Pink night at the Kaw Valley PRCA Rodeo July 25 raised awareness and funds for K-State cancer research. 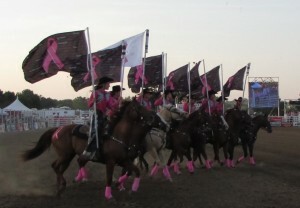 Rodeo spectators, participants and even horses wore pink! A pink balloon launch and cancer survivor recognition ceremony honored all who have ever faced cancer. The Silver Buckle Drill Team from McPherson did a special breast cancer awareness performance and Guardians of the Ribbon brought their pink fire truck, Nicki, from Wichita again. The Kaw Valley Rodeo Association’s TETWP committee also held another successful spaghetti dinner, sponsored by Cox Bros. BBQ and First Presbyterian Church. We are so grateful to the Kaw Valley Rodeo Association and the “Pink Committee” for choosing to support local cancer research! This year’s Tough Enough to Wear Pink campaign raised almost $9,000! That brings their total to $67,000!